When buying a brand new car, when you buy can be extremely important. For example, one of the best times to get a great deal on a new car is when a new registration plate is about to be released. This happens twice a year, at the start of March and September. So, if you want to pick up a great deal, then the months just before these dates could be a great time to buy. Another thing to bear in mind is that most showroom salesmen often have quarterly targets to meet, so they need to sell a certain number of cars each quarter. With this in mind, aiming to buy at the end of March, June, September or December might also lead to big savings, as there may be more flexibility available on purchase price or finance deals in order to meet targets. Finally, you might also be able to pick up a bargain when a new model of a popular car is being released. For instance, there has recently been a new 2017 model released of the ever-popular Ford Fiesta. So, if this type of car might fit your needs, then there could be big discounts available* on the outgoing model. 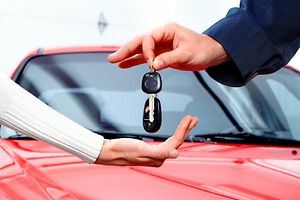 Another good way to save money when buying a brand new vehicle is to take advantage of ‘genuine’ dealer incentives, or even government incentives. When talking about dealer incentives, I say ‘genuine’ because, often times, the incentives offered aren’t as good as they look when you read the small print. There are some genuinely good incentives around, though, so be sure to keep your eyes open and do plenty of online research to find these incentives. You could also take advantage of any government schemes that may offer a discount on a new vehicle, such as the proposed diesel scrappage scheme that was recently announced by the UK government. Of course, one of the main things that you can do to save money on a new – or any – car purchase is to improve your negotiating skills. To do this, be sure to do as much research as you can on vehicle pricing, so that you can head into the dealership with a firm and realistic idea of how much you are willing to pay and what you ideally want to get out of the deal. If you find that the dealer is not being as flexible as you would like, then don’t be afraid to walk away and look elsewhere, or perhaps try again at a later date. Remember, buying a brand new car is a huge purchase and it shouldn’t be done on impulse. So, if you’re sure that the price that you are looking to achieve is reasonable and realistic, then stay calm and walk away if you feel you’re not being offered the deal you would like. Do you have any tips for those looking to buy a brand new car? If so, please feel free to leave a comment below.